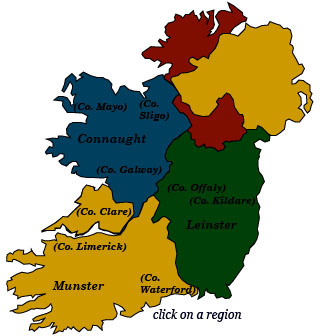 Jump to a list of all Irish castle hotels here, or click on a region. Haven’t decided on a hotel yet? You can look at other available hotels in Ireland with Booking.com. Ireland has been invaded since the time of the Vikings and Danes, but it was the fateful Norman invasion that permanently changed the face of the countryside and established its devastating link with Britain. As the Normans captured a new district in Ireland, they built fortresses known as motte and baileys to protect it. These forerunners of stone castles were made of wood on mounds of earth with a fortified enclosure at the base of each mound. During the next four centuries the Normans built castles throughout Ireland, including 900 around the Shannon area and 235 stone castles in County Wexford alone. Today many castles are open for exploration, hotel accommodation, private rental, and even medieval banquets. Every region of Ireland is enchanting! Connaught With a low population, this ancient Celtic province has inspired poets and writers with its lush landscape, rugged coastline, and lonely valleys. Leinster Home to some of Ireland’s most sacred sites and grand castles, this region is marked by rolling hills, lakes, bogs, and farmland. Munster Dramatic coastal scenery, wild terrain, glassy lakes, and rolling farmland make traveling in this region of Ireland an utter delight. Castles dotting the landscape give testimony to the Anglo-Norman invasions.